- Preheat oven to 350 degrees. Make the cakes: Sift 1 1/3 cups sugar, the flour, cocoa powder, baking powder, baking soda, and 1 teaspoon salt into a bowl. Combine oil, water, and vanilla. - Whisk egg yolks with a mixer on medium-high speed until pale and thick, about 5 minutes. With machine running, slowly pour oil mixture into yolks, and then add sugar mixture. - In a clean mixer bowl, whisk egg whites on medium-high speed, gradually adding remaining 2/3 cup sugar, until medium-stiff peaks form. Mix one-third of the whites into cake batter, then gently fold in remaining whites. - Divide batter between two 12-by-17-inch parchment-lined rimmed baking sheets, and spread evenly using an offset spatula. Bake until cakes are set and spring back when touched, 18 to 20 minutes. Let cool. - Assemble the baked Alaska: Coat six 11-ounce bowls or ramekins with cooking spray; line with plastic wrap, leaving an overhang. Cut out 6 cake circles to fit in bottoms of bowls (we used a 2 1/2-inch round cookie cutter), and place one in each bowl. Top each with 1/3 cup chocolate ice cream, smoothing surface. Cut out 6 cake circles to fit on top of ice cream (we used a 3 1/2-inch round cookie cutter), and place on ice cream. Freeze until set, about 30 minutes. - Top each cake with 1/3 cup ice cream, smoothing surface. Cut out 6 cake circles to fit on top of ice cream (we used a 4-inch round cookie cutter), and place on ice cream. (This should fit just at the top of the bowl.) Cover assembled cakes with plastic wrap overhang, and freeze for at least 4 hours. - To remove from bowls, open plastic wrap, flip cakes onto a baking sheet, and remove plastic wrap. Freeze cakes while making meringue. - Preheat oven to 500 degrees. Make the meringue: Heat egg whites, sugar, and cream of tartar in a heatproof bowl of a mixer set over a pan of simmering water, whisking often, until sugar dissolves and mixture is warm to the touch, about 2 minutes. Transfer bowl to mixer, and whisk until stiff peaks form, about 10 minutes. - Cover each assembled cake with 1 cup meringue. Bake until meringue is browned, 2 to 3 minutes. 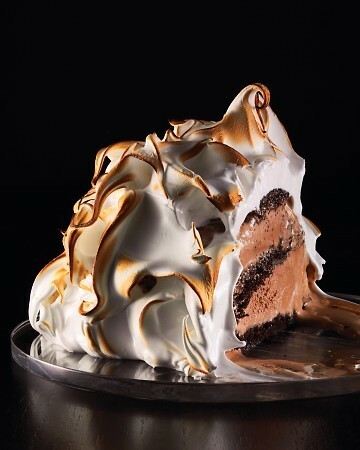 Alternatively, hold a small handheld kitchen torch at a 90-degree angle 3 to 4 inches from surface of meringue. Move flame back and forth until browned and caramelized.